My cute neighbors recently got married. I collected a good amount of donations from all the other neighbors to give the happy couple a gift. 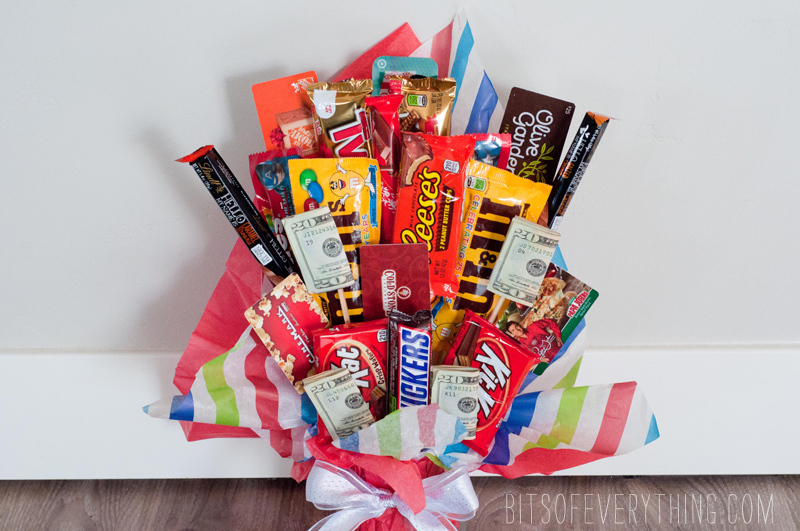 What I decided to give them was a candy bar bouquet filled with other good things like gift cards and cash. It was so easy to make and my neighbors loved the gift! This really would make a great wedding gift, teacher gift, birthday gift, or a gift for any other holiday too. First, take your foam block and put the tissue around it. I tried to make it so that the tissue was taller in the back, shorter in the front. Then, tape all your goodies onto sticks. I used kabob sticks and some shorter caramel apple sticks. It was nice to have 2 different heights to work with. 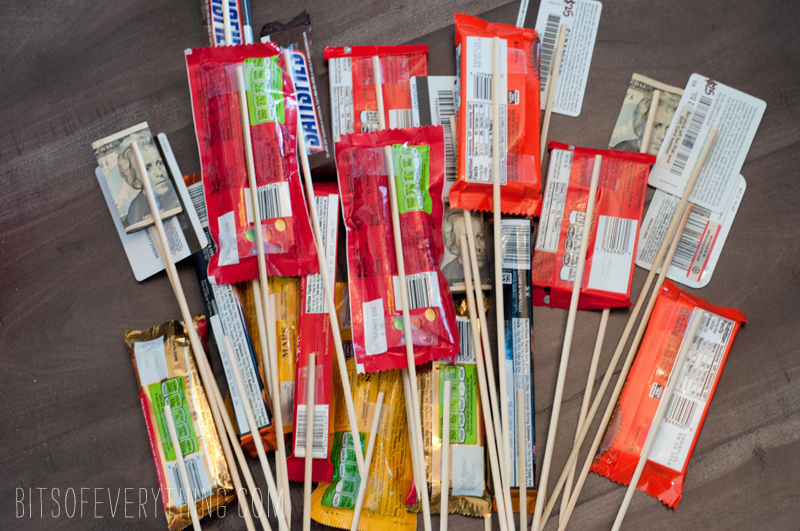 We also taped some candy as high as we could on the stick and some lower on the stick. This helped give us a variety of height as well. Arrange all your goodies like a bouquet of flowers. I started with the m&m’s in the middle and then added things behind them and in front of them. I also tried to keep it symmetrical. Finish it off with a ribbon around the vase and a card. 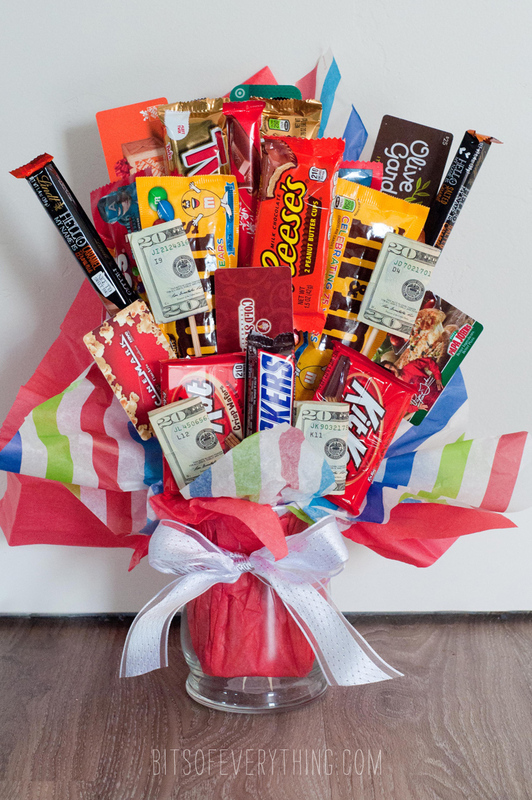 This bouquet contains $140 in gift cards and $80 in cash, plus the treats, but this would be so easy to make bigger or smaller. 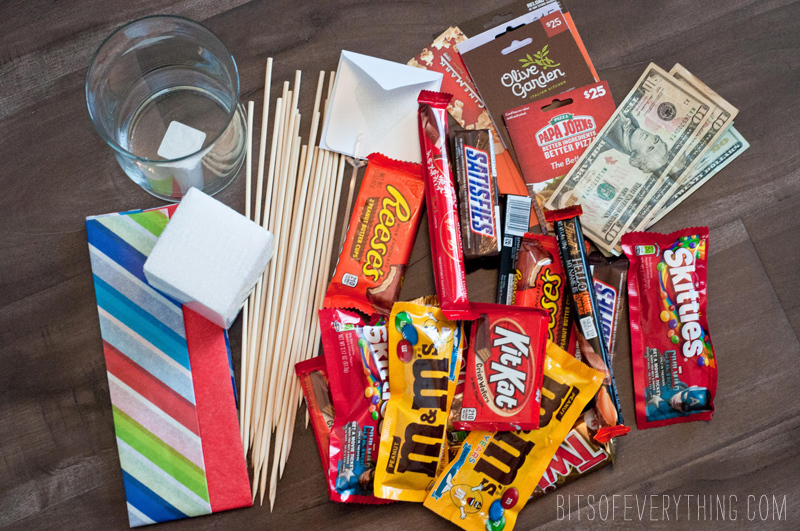 Bigger – more candy, bigger vase, more gift cards, more money. 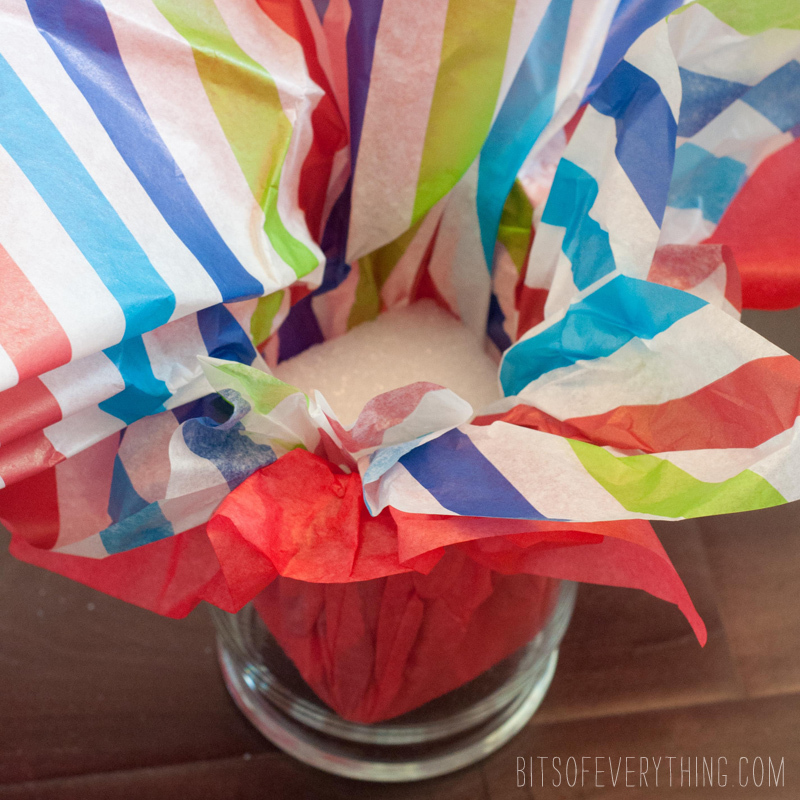 Smaller – less candy, smaller vase or bucket, less gift cards, less cash. You can adjust this to any size that would work perfect for you and your budget. You might also enjoy our Candy Bar Letter ideas. That’s a nice candy setup. I like how everything blends together. I have done something similar but never thought of using dollar bills, nicely done. If you want to see what I have been doing you can check out my website at Parapluseattle.com. The candy and the “booze” basket look awesome. It’s truly very complicated in this full of activity life to listen news on TV, so I just use world wide web for that reason, and get the newest news. sorry to say your picture is being used on a scam face book page called Be Happy Today.